Movement, consistency, motivation, and discipline...all elements of Stormi's approach as a student, instructor, and teacher. In 2006, after leaving her first official mat class, Stormi was immediately intrigued by the Joseph Pilates method and began her career as a Power Pilates Instructor/Teacher Trainer. Stormi, a native Texan, was driven to dance prior to learning to walk and has never stopped. By age 10, under the mentorship of Joyce Seaborne Bader, Stormi solely focused on classical foundations, progressing with Distinction through the Royal Academy of Dance (RAD). During this time she was granted scholarships to the American Academy of Ballet and captured leading roles with Fort Worth/Dallas Ballet, directed by Paul Mejia. As a Teacher Trainer, Stormi embraces mentoring apprentices, testing, and supporting them through their rigorous certifications and benchmarks. 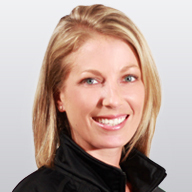 She has been responsible for the certification of instructors locally and nationally in both Power Pilates and Vbarre. Stormi understands and respects her role as a Teacher Trainer and strives to be a good steward of the brands, maintain their consistency, and ensure her aspiring teachers are fully prepared for their professional journeys. Observing the long-standing benefits of Pilates' classical, systematic and integrative approach as well as Vbarre's complementary philosophy, Stormi believes she has chosen the best of two worlds. Movement, consistency, motivation, and discipline, each elements of Stormi's approach as a student, instructor and teacher, play unwavering roles in Stormi's ability to enable her clients to surpass their fitness and professional goals. Find Stormi Truesdell at a studio near you.